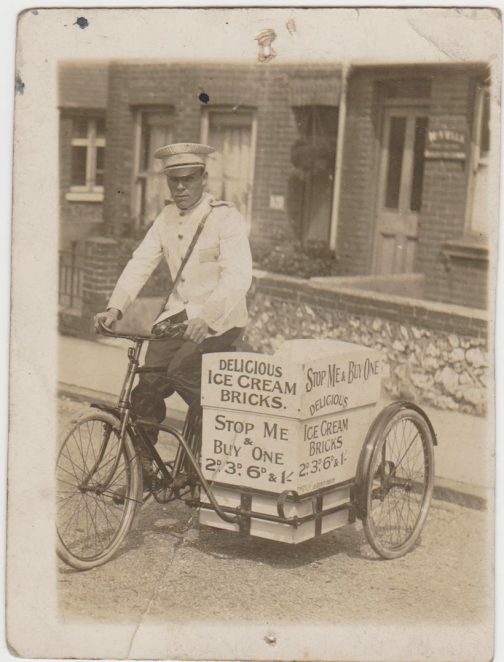 This is my Dad’s brother, Uncle Tom, photographed on his job of selling ice-cream in early 1930s Brighton. Look at those prices, I guess we could buy the whole lot from him for the cost of just one ice-cream at today’s prices. Maybe with the bike thrown in as well. Does anyone remember ice-cream sellers like Uncle Tom? If you do we would love to hear about them. I was not born when Uncle Tom was doing his rounds, but I do remember an ice cream seller who came around the streets in the late 40s, early 50s. I think he came from a shop called ‘Gizzy’s Parlour’ in St James’s Street. He would call out ‘Ica da crema’ when he did his rounds on a Sunday afternoon. I never did understand how he could keep his wares frozen in that little box before fridges were the norm. Now I am in my 70s but still remember the taste of real ice cream, nothing like what is served today. I have never seen the chap in the above photograph, but I well remember the Wall’s ice cream tricycle with its blue and white colour and the logo “Stop me and buy one”. Also the seller used to ring his very large bicycle bell which could be heard some distance away. There was also a greater variety of items. Great photo Joy. Do you know where in Brighton it was taken? Hello Ron. I remember the man you are talking about coming round the streets selling ice-creams. He was a short tubby Italian, pulling his ice-cream van; I think it ran on electric. He used to pull it by a long handle in the front shaped like a crowbar, but longer of course, with press buttons and a break at the end. Can’t remember his name, I think it was Tubby or Tubs, but we used to follow him hoping for a freebee. Gizzy’s Parlour was Italian I think? Hi Alan, I’m sorry I don’t know where it was taken exactly, but it looks somewhere like the houses off Fiveways maybe, or off The Dip judging by the houses - but they’re pure guesses. We lived in Sussex Terrace and it’s definitely not there. I’ve tried figuring out what’s on the wall plaque behind him – but with no luck. I can remember a little Italian ice cream seller, used to come around the John St./Sussex St. area, name of Qualer or Croller? Why can’t we get ice cream that tasted that good now? This is very strange coming across this: Alan the little Italian man was my great uncle. His name was Dominic Croller. Yes you are right about his rounds. He used to deliver for my late grandfather Lugi Marcantonio who owned the business. My grandfather, his wife and his sisters – one who was Dominic’s wife Adalina made the ice cream in a make-shift factory in the back of my grandparents house. I don’t know what the health inspectors would have to say about that now! Nice to see that people remember my family. Regards Michael Bonner.